As survivors are dying out memories are becoming history. Yet, histories are influenced by memories, and memories have histories too. While it is possible, it is worth examining the nature of Holocaust memories. This essay hopes to contribute to understanding the nature of Holocaust memories in survivors. We are our memories. We sometimes search for them as if our lives depended on them. At other times, memories haunt us and we avoid them as if they were our deadliest enemies. During this struggle our memories play many tricks on us. If we are our memories, it may not be clear who we are. Consider the professional woman, married with children, apparently leading a normal life. Yet, she believed that she carried a “madness” in her core. This was because she had recurring, terrifying images of falling backward into a sea of excrement. It was not until she realised that this image was a memory of her experience as a young child of the latrines of Teresienstadt that she was able to regain her sense of rationality and freedom from the images. Even memories clearly imprinted from objectively contextualised events may take inordinate space and energy and leave other angles of the events in shadows. For instance, a survivor described in detail his experiences of his death march. When I asked him how he survived without food for weeks on end, he eventually recalled that at one time people floated bread down a river for the prisoners. Some were apprehended and killed for their actions. Not long ago, it was thought that memories were like a book in which events were inscribed and could be retrieved at will. That was more or less true for everyday memories, though they too were influenced by other memories, biases, and needs for coherence and attrition. Most controversy has centred on traumatic memories. Did they represent objective truth? For instance, did flashbacks represent true pictures like flashbulb imprints on photographic plates? Or, was traumatic memory unreliable, as proven by different memories of different witnesses of a car crash? Were memories twisted for the sake of financial compensation? Were memories inserted by therapists as claimed by false memory experts? At times survivors of trauma were their own worst enemies, for their evidence seemed often partial, confused for chronology, and taken over by emotion. This is how I experienced many survivors whom I interviewed for restitution, when they tried to answer their children’s questions, and in therapy. Holocaust literature, and its concerns with memory, now spans 70 years. Throughout this time there were concerns about if, and how, the Holocaust would be remembered. In fact, there was evolution of adult memories. Child survivors’ memories were discovered too, as were transmissions of memories to subsequent generations. Society’s receptivity to memories changed as well. And yet, neither Holocaust memory nor its contribution to memory generally has been woven into a theoretical framework. What follows are some observations that may contribute to such a framework. My observations stem from my role as a mental health practitioner who has seen many survivors in my practice, as co-founder and member of a Child Survivors of the Holocaust group, as a general traumatologist, and not least as a survivor myself. Memories were fallacious already while traumas were occurring. Sometimes prisoners ‘forgot’ the significance of the chimneys in concentration camps. They started to forget images of their loved ones. Such extreme suppression and denial, erasure and numbing enabled prisoners to survive from moment to moment. Memories would have evoked terror, grief, yearning, indeed much emotion. Emotion would have threatened survival. I was a four-year-old who did not cry when separated from my parents. I tried not to think about them while in the care of others. My parents returned and we lived in open hiding as Aryans. I had to forget my previous identity. To do so convincingly, I had to “really” believe our pretence existence and “forget” my real past. After the war, survivors shared their stories. Many wrote letters to their relatives. They informed them who had died, who still lived. They briefly described their own travails. Some wrote short documentaries of their experiences. Many were lost over time, and most were not translated from their original language, mainly Yiddish. A notable exception was Primo Levi who wrote the precursor to If This Is a Man (1965) in 1946 but published more widely twenty years later, and Rafael Rajzner’s The Annihilation of Bialystoker Jewry, an unusually faithful documentary, which he wrote in 1948 (Rajzner, 1948), restored in The Stories Our Parents Found Too Painful to Tell by Lew (2008) sixty years later. It took decades for the world to listen and for most survivors to tell. Even Ellie Wiesel required a decade to recover in order to start writing about his experiences. His Night first appeared in 1958 (Wiesel, 1958). [W]hen I talk to you about Auschwitz, it is not from deep memory that my words issue. They come from external memory . . . from intellectual memory, the memory connected with the thinking processes. Deep memory preserves sensations, physical imprints. It is the memory of the senses. For it isn’t words that are swollen with emotional charge. Otherwise, someone who has been tortured by thirst for weeks on end could never again say, ‘I’m thirsty. How about a cup of tea.’ This word has also split in two. Thirst has turned back into a word for commonplace use. But if I dream of the thirst I suffered in Birkenau, I once again see the person I was, haggard, halfway crazed, near to collapse; I physically feel that real thirst and it is an atrocious nightmare. (Caruth, 1995). Note how the speaker can only remember reality in the world of sensations and dreams, where words and thoughts are absent. Words actually interfere with memory. Survivors say they cannot speak of the unspeakable, they cannot tell a story that cannot be told. As soon as language enters the picture, the truth is effaced. Even thinking about past traumas erases their poignancy. When survivors genuinely try to remember and tell, they break down, they lose language, logic, and sequence. They are in a preverbal instinctive state akin to infants and animals dominated by motivation to survive. Elie Wiesel (1989) said that the enemy, ironically, achieved his goal. Since he committed crimes beyond the scope of language, they cannot be told. The result is that survivors’ memories are in a psychological and moral vice. To remember smashes the mind; to forget betrays the dead.The untellable story must be told, to fulfil the call, “Tell the world what happened to us.” But to survive one must forget. I have often seen traumatised people struggle with the angel of forgetfulness. The stakes are always high. To remember reveals physical knowledge of life and death, an intimacy with the roots and branches of the tree of good and evil. The tree is oneself. But to not know is to abjure oneself. It means to renounce love because a cloak of forgetfulness protects oneself from the hazards of loss. We smudge out the tree and we do not pluck its fruits. When survivors do not remember; they, as it were, continue the Holocaust. They work from day to day, survive, accumulate a buffer for survival for themselves and their children. They might have successful marriages and careers. But they can only envision the present and the future, even if they are unwittingly directed by the past. How can this split in memory be explained scientifically? What divides knowledge of thirst as told in words and as experienced in nightmares? One view is that traumatic experiences are imprinted in primitive preverbal brain structures, such as the amygdala and hippocampus. The sites, when kindled by current triggers, become active and people relive their traumatic experiences. Such relapses and their avoidance constitute Post-Traumatic Stress Disorder (PTSD). More recent research indicates many memory systems throughout the brain. One large system utilises the right hemisphere of the brain (Sperry, 1961; Schore, 2002). This part of the brain is non-verbal; it feels but cannot think. It lives in the experience, is automatic, and has no concept of time or to whom it belongs. It is self-unaware. It is connected to involuntary parts of the nervous system and through it to bodily organs and sensations. This hemisphere has features of what was called the unconscious. It is to this area that trauma is dissociated, and it is here that it weaves its tree-like patterns of unconscious judgements and meanings. It is from here that physical, psychological and behavioural symptoms, as well as judgements and meanings escape into consciousness as reminders that something is wrong. It is these memories that are triggered when one tries to tell the story. And as one re-enters one’s memories, one relives the same fragmentations, oppressions and explosions of experiences that one experienced at the time. It takes new experiences of hope, trust, and faith to relive these experiences and to place them in context, history, in narratives, and in self-forgiveness. In my practice I have been the ferryman who transferred in his boat traumatic memories across the river Styx, from oblivion to revelation, from eternal subterranean experience of hell to self-awareness and a vision of the forbidden tree. The boat was my own right brain, which had to reverberate with the right brains of my traumatised patients and my left brain, which translated their experiences into words (Valent, 2009). They had to trust that I empathised and understood, and that their journey with me, the union of their whole brains, which included reliving their traumas, would benefit them. Many survivors, and indeed many therapists, believed that knowledge was not worth it. What benefit could there be from full knowledge of what happened? In the 1960s, survivors were required to recall their experiences for German restitution purposes. For the first time, some open-minded psychiatrists, mainly psychoanalysts, described the sufferings of survivors, including their suppressed memories. They found that a receptive, constructive audience was necessary for memories to be released. Survivors could have years of psychoanalysis and, yet, without sympathetic analysts their memories remained dormant. For approximately another three decades, memories were split between documentary tellings in books, memorials and museums that answered the need to “Tell the world what happened to us,” and private relivings in nightmares, flashbacks, and thoughts. In the 1990s, a number of events converged. The Cold War ended and the world was ready to listen to the most challenging lessons of the fading millennium. Survivors had attained safety, families, and their own country that was flourishing. This was their last chance to tell. Holocaust films like Schindler’s List and personal memoirs abounded. Survivors gave their testimonies in tens of thousands to the Shoah Foundation. At the same time, pressures to remember emanated from survivors’ children. This was because they suffered scars whose wounds they could not understand except through their parents’ memories. Survivors and their children, even grandchildren, visited survivors’ places of trauma in an attempt to explain survivors’ grief. In the 1990s, an unremembered group of survivors made their appearance – child survivors of the Holocaust, that is, those survivors who were children in the Holocaust (Valent, 2002). Their own memories were overshadowed by their parents who told them, “What would you know, you were only a child,” and who desired that their children remembered nothing. So suppressed were these child survivors, that they had not even recognised themselves to be survivors. When I was asked by Sarah Moskovitz, one of the discoverers of child survivors, whether I was a survivor, I said, “No, my parents were.” She checked my age and residence during the war and insisted that I was a child survivor. And so, in the 1990s, child survivors’ memories were released. They had additional problems with their memories compared to adults. Even in normal times, for children under seven, and especially under three, memories are non-verbal. Therefore, in such children traumatic memories were expressed in sensations, emotions, and behaviours without accompanying thoughts. They were especially prone to misinterpretations. For instance, separations from parents were often interpreted as rejections and punishments. My own memories were fairly typical. At the age of four I was separated from my parents. They were arrested in the street by the local police. I did not remember that event. I fleshed out my memory in trauma therapy during my revisiting the site of separation. It took me a long time to understand the context of my underlying anger with my mother for “leaving” me, without even looking back with regret. It took me even more years to understand that, had she looked back, I would have run to her. Her restraint was to stop that and to save my life. I had no conscious memories for the three months of my separation from my parents. But when I revisited the farm where I was hidden during that time, I remembered the outhouse, a well that had since been filled, and the feel of walnuts from a tree that I had climbed and which was still standing. When I squatted to a child’s height, I saw corn fields, a memory I could not place previously. Other child survivors similarly remembered things correctly, even when they did not understand the meaning or contexts of their fragmented memories, like the woman who had images of excrement. The validity of memories of child survivors of the Holocaust (Valent, 2002) helped me to believe similar memories of survivors of other types of childhood traumas. In the last two decades, survivors of a variety of ages continued to balance their memories between the Scylla of forgetfulness, and the Charybdis of remembrance. In the proper environment, there was never an end to opportunities for remembrance to provide benefit. Juliette, a child survivor, described her meeting with her father on his deathbed (Valent, 2002). And then he confided in me his eternal regret about how he had neglected to send my mother and me to his sister in England. “I have never been able to forgive myself for not sending you.” …That was the first time in my life that I saw my father emotional. He was very emotional. This was normal, and it had always been there… this man had been wanting to cry for years… [for] the guilt which he carried for his wife’s death and my suffering… everything totally changed. And I realised that I as a person had never been rejected.’ I told him he had done the best he could…The last moment of my father’s conscious life was an active, loving, taking leave of me. There was no mistaking the feel of it. (p. 141). 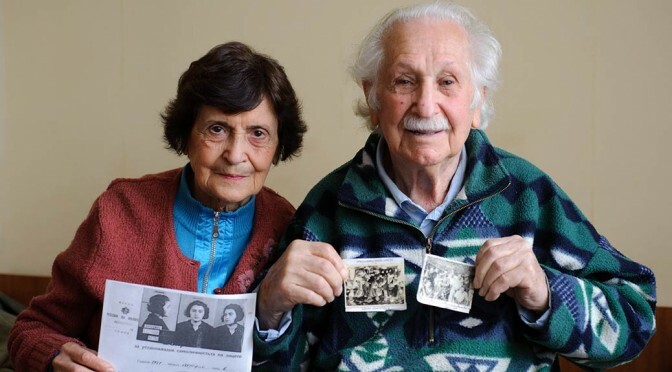 The more survivors were able to make meaning of, and to achieve purpose in their lives, the more they faced Holocaust related guilt, shame, injustice, and tragedies, and the more they remembered and told. Memories have kept surfacing to current times. In fact, in recent years some of the most painful memories have surfaced, such as those of sexual abuse. Still, many survivors maintained their silence until they died. Occasionally, only after death did they expose their memories in hidden photos, artefacts, and writing. Unfortunately, to the very end of life they can flare up in their original nightmarish forms. In fact, physical illnesses, with their accompanying helplessness and erosion of defences, combined with mental decline can make survivors especially vulnerable. Hospitalisation may mean, for them, being sent to die. A doctor with a syringe can equate to a Nazi killing sick prisoners. However, there is another side. Some appreciate the comfort of dying in a civilised bed, carrying a respected identity, and surrounded by loving relatives. In summary, memories, like the rest of our bodies and minds, are our servants that help us to survive and fulfil our lives. In normal times they serve us to build coherence, integration, a foundation from the past to the future. In such situations remembering facts is objectively useful, but memories are adjusted according to the needs of coherence and comfort. Trauma, on the other hand, needs to be remembered or forgotten precisely. A pouncing tiger at a waterhole in the dark must be recalled clearly to avoid future catastrophe. On the other hand, the memory must be closed off in order not to be frozen or impelled to run during normal daily tasks. Yet the memory must erupt and evoke immediate response if there are cues of a real pouncing tiger. Humans suffer traumatic neuroses because their environments change. Irrationality or psychological illness occurs when survivors relive or avoid Holocaust traumas beyond the Holocaust, as if they were eternally in the dangers of the Holocaust jungle when in fact they are safe. Even if exposed and received with care, memories do not heal traumatic wounds. Memories that bridge experience and knowledge take survivors out of the jungle, but provide them with knowledge of the jungle, its cruelties, and its reverberations. On the positive side, memories that connect with the whole brain and mind provide context, they can resolve secondary traumatic accretions, and they provide wholeness and capacity to love to the person. Treatment needs to be careful, however. Survivors must not be thrust back into the jungle and be retraumatized. From the beginning of the trauma, memory served survival and the hope of ultimate fulfilment of a life. In the end, memory serves the same goals as appraised by the survivor and society. Memory is the product of the equation between the benefits of remembrance and forgetfulness. That is how it was, is, and will be for future generations. Survivors and the world may be wrong. Perhaps the Holocaust should be remembered more than it is, because the future is more hopeful if we can connect humanity with its potential to manufacture traumas. Such knowledge may allow our whole minds, with remembering, and complete with the knowledge of memory, to prevent future, unnecessary catastrophes. Laub, D., Allard, M. (1995). Trauma inherited, trauma reclaimed: Chamberet: Recollections from an ordinary childhood. In Cathy Caruth, (Ed. ), Trauma: Explorations in Memory. (Baltimore and London: Johns Hopkins University Press, p. 154. Levi, P. (1965). If This Is a Man. London: Bodley Head. Rajzner, R. (1948). The Annihilation of Bialystoker Jewry. Melbourne: The Bialystoker Centre. Lew, H.R. (2008). The Stories Our Parents Found Too Painful to Tell. Melbourne: AMCL Publications. Sperry, R. W. (1961). “Cerebral Organization and Behavior: The split brain behaves in many respects like two separate brains, providing new research possibilities”. Science 133: 1749–1757. Wiesel, E. (1958). Night. Paris: Les Editions de Minuit. Wiesel, E. (1989). Questions That Remain Unanswered. In Papers for Research on the Holocaust, 7: Haifa University.